In 1974 Dr Paul Lam, a family physician from Sydney Australia, took up tai chi to control his arthritis. Tai chi helped him overcome his condition, it also improved every aspect of his life. Dr Lam has created a series of Tai Chi for Health programs and produced instructional materials to make tai chi easy and enjoyable to learn. Through his privately owned company, Tai Chi Productions, his team have produced many best-selling titles worldwide. In 2013, the Centers for Disease Control and Prevention and National Council on Ageing recommended Dr Lams program. Many governmental departments around the world endorse them. One of the most sought after teachers, Dr Lam must be the first in history to have travelled over a million miles teaching tai chi. There are over eight million people around the world who have enjoyed and benefited from Dr Lams Tai Chi for Health programs. 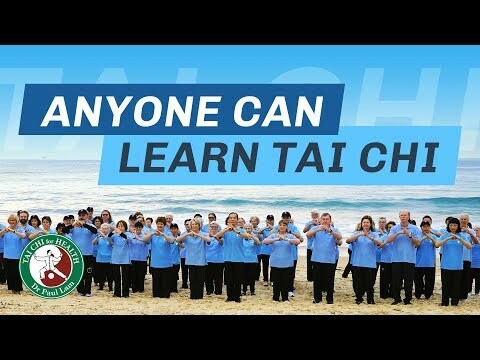 The Tai Chi for Health Institute was founded in 2010 by Dr Lam and many of his Tai Chi for Health colleagues with the purpose of empowering people to improve health and wellness through the Tai Chi for Health programs. Also to monitor the quality and standards of the training and to provide support for instructors. It is a non-profit organisation registered in Australia and governed by a democratically elected board. Both organisations have the same purpose and naturally there is close collaboration to save resources. That does not compromise either organisations independence. Dr Lam is committed to supporting the Tai Chi for Health vision and has always personally offered significant discounts to instructors of the program through Tai Chi Productions. Scroll down for profiles of the Board members. Our primary focus is to train safe and effective instructors for the program. • Developing effective programs though research and development. • Making the world aware of tai chi as a modality which promotes health. a) Certify instructors and updates. 1) Modify existing programs as needed and create new ones as the need arises. 5) Provide leadership for targeted clinical research in fall prevention, arthritis, diabetes, osteoporosis, health challenges for kids, etc. Making the world aware of tai chi as a modality that promotes health. 1) Collaborate with other organizations such as the Arthritis Foundation. 2) Serve as a resource for health policymakers, academics, and practitioners including journalists, teachers, youth and civic leaders. Director Dr Paul Lam, a family physician in Sydney and a tai chi teacher since 1976, is a world leader in the field of tai chi for health improvement. Dr Lam is dedicated to promoting tai chi for health and wellness. He has participated and published in peer-reviewed journals research projects relating to tai chi for health improvement .Dr Lam has composed several Tai Chi for Health programs that are supported by Foundations around the world including that of Arthritis foundations of Australia, America and UK. By 2014 over five million people around the world have learned and benefited from one of his programs. Dr Lam has written 4 books: Overcoming Arthritis, Tai Chi for Beginners and the 24 Forms, Tai Chi for Diabetes and Teaching Tai Chi Effectively. dicine, and Associate CMB (education) for NUH since June 2010. He graduated in 1991 from the National University of Singapore and is a fellow of the Academy of Medicine Singapore (rheumatology) since 2001 and the Royal College of Physicians (Edinburgh) since 2004. He holds a MMedSc degree in Clinical Epidemiology (University of Newcastle, Australia), and a graduate diploma degree in acupuncture. He is the president of the Osteoporosis Society (Singapore) and the vice-chairman of the National Arthritis Foundation. As there is medical evidences that Tai Chi for Health exercises are proven to improve joint pain and function, prevent falls and osteoporosis, he is keen to promote this exercise in Singapore and the Asian region. Margaret Brade was the first UK Senior Trainer having played a leading role is establishing Paul Lam’s Tai Chi workshops in England. She continues to instruct and to support the spread of workshops in many ways. Margaret has a history of voluntary and community work over many years, becoming a full-time occupation in 1994 when, driven by strong values around empowering people to health, wellbeing and independence, she left her career in the private legal sector. Margaret was appointed to the position of Chief Executive of Age Concern Stockport early in 1995 and has established a respected reputation for openness, integrity and positive partnership working. Margaret has shown great commitment and dedication to preventative activities both in her work and personal life, and particularly champions Tai Chi for Health across the many sectors she works in partnership with. Through her work she has innovated and established groundbreaking preventative non-clinical programmes earning national recognition. Margaret has played an interested role in the development of the Institute from its beginnings. She has used her considerable knowledge skills and experience both as a lawyer and as a Chief Executive in a leading voluntary organisation to benefit the thinking and the eventual structure, principles and policy of the Institute. Winnie Lo, BSc, was educated at the University of Bradford, UK, and her family immigrated to Australia from Hong Kong in 1990. In 1991 her husband started his community pharmacy business. she had been helping him in running the business from then until 2012 when he sold the business. Winnie is used to being in contact with patients of all kinds, some of them paying visits to doctors almost everyday, She feels the urge to maintain good health and be positive. So she started her tai chi lessons with Better Health Tai Chi Chuan in 2014 and become a trainee instructor in 2016. She hope that through teaching she can share her experience and the joy of doing Tai Chi with others. Winnie is enthusiastic at servicing the community through working with non profit organisation, especially in association with the Tai Chi for Health vision. Brenda has a Bachelor of Education degree, is a retired school teacher and a volunteer with several organizations. As the South Australian Representative of the Tai Chi Association of Australia she organizes meetings and coordinates activities for members. Her Tai Chi experience began 1978 when she attended classes run by the Chinese Association of South Australia. In the mid nineteen eighties the opportunity arose for her to teach Tai Chi and extend her Tai Chi skills. She has continued learning and teaching with a variety of teachers, schools and groups until this present day. In 2005 Rosemary Palmer introduced Brenda to Dr. Lam’s Tai Chi for Health Programs. As a Tai Chi for Arthritis Leader she taught as a volunteer at a local medical centre. She observed that this modified program allowed participants to work at their own pace, become confidence in their own abilities and build lasting friendships. During this time she assisted in workshops. Sarah Malia, MS, JD, is a Tennessee elder law attorney and social scientist in the US. Sarah has practiced law for over 10 years and has extensive training and experience in elder and family law, mediation and collaborative alternative dispute resolution, and family dynamics. She graduated with honors with a BS from the University of Tennessee-Knoxville (UTK). And she received her JD in Law and MS in Family Studies from the University of Missouri-Columbia (MU). Along with maintaining a part-time solo legal practice, Sarah teaches in the Child & Family Studies Department at UTK. Soon after becoming a licensed attorney, Sarah and her mother took a tai chi class together and both fell in love with tai chi and qigong. Her father joined the fun thereafter, and now all three have taken numerous TCHI courses and became certified instructors in TCA. As an elder law attorney and higher ed instructor, Sarah believes that tai chi provides lifelong health benefits and joy for all who embrace it. Related Articles: What are the Tai Chi for Health programs?